Last evening I found this fly resting on our Pink Fairy Duster (Calliandra Eriophylla). About the size of an adult small fingernail, it nonetheless caught my eye with its bright orange eyes. Each eye consists of hundreds of lenses at differing angles. It is believed that compound eyes result in a "mosaic" image to the fly, and the more lenses there are, the more resolution that exists in the mosaic. Compound eyes are also thought to detect motion better than still objects. 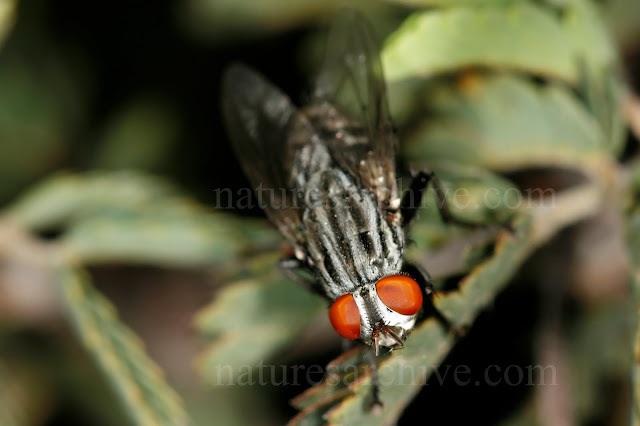 Flesh flies are some of the more stereotypically "gross" flies. They breed in carrion, and there larvae are what we generally refer to as maggots. Maggots continue to feed on the carrion or other matter in which they hatched, and ultimately burrow into the ground to mature. As adults, they live for less than a week. The exact species of this fly will likely never be known. According to many resources, only a dissection will allow for exact identifications of flies in the Sarcophagidae family. However, most flesh flies do have large orange eyes, and some gray/black striping, making them relatively easy to casually identify. Both of those field marks are clearly evident in the photo above. 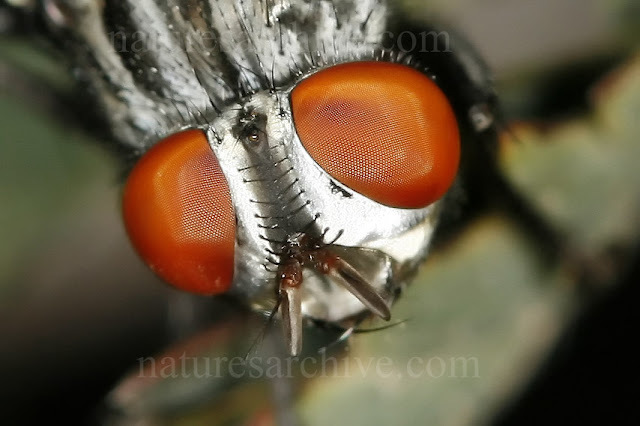 One last note - the Flesh Fly eye close-up picture above is posted in full-size on Nature's Archive in the "Nature Up Close" section.